If you have visited the two most recent group exhibitions on the ground floor of Istanbul Modern this year, you might have realised that they shared an artist and an art work: Cevdet Erek's works were on exhibit in "The Neighbours: Contemporary Narratives from Turkey and Beyond" show in Spring, and they can be seen in this Summer's new "Plurivocality: Visual Arts and Music in Turkey" show, curated by Çelenk Bafra and Levent Çalıkoğlu. One of the most unique figures of Turkey's art scene, Erek's international career has also flourished in the past few years, culminating in an announcement on his website last week. Erek made the announcement in typically modest fashion, as if writing about a trivial thing. His "Rulers and Rhythm Studies" have been added to the permanent collection of Stedelijk Museum Amsterdam, one of the leading contemporary and modern art museums in the world. "The Stedelijk Museum in Amsterdam is now exhibiting 'Rulers and Rhythm Studies' as part of their collection display," the announcement read on his website, cevdeterek. com. "This presentation is similar to when the work was installed for the first time in Istanbul; the table is a little different, it is white, and in addition, sound pieces of Circular Week and Rhythm 1 are also included on the wall (which, either due to the physical conditions of a group exhibition or because I wasn't convincing enough, were not exhibited then). 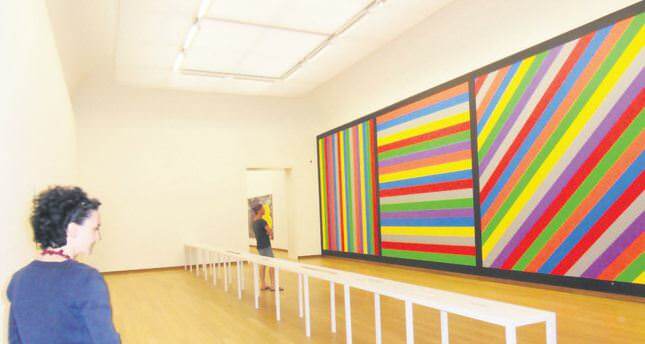 On the wall in the back is Sol LeWitt's colorful wall drawing no:1084, I believe that it is permanent." Erek's inclusion means that works by an artist from Turkey is added to Stedelijk's collection for the first time. Furthermore, Erek has been appointed as artistic adviser to Carolyn Christov-Bakargiev who will curate the 14th Istanbul Biennial which will be held between September 5 and November 1 2015. An architecture graduate, Erek has received a PhD in sound from Istanbul Technical University's Center for Advanced Studies. He specialises in site specific works, and the title of his new group exhibition, "Pluravocality", may also be used to define his work. When I met him, Erek seemed excited about this exhibition where some of his earlier work is on display. "While preserving 'Black with White,' the work I've exhibited in the 'Neighbours' exhibition, I created a new environment," he said. The work consists of a set of objects (rings, rulers and an old radio, among others) which constitute a narrative about an adventure Erek has had in different cities, including Amsterdam, Cairo, Antwerp, Beirut, Pori and Istanbul. "I wanted to show works that were produced over a long period of time but wanted to do so in such a way that they would be taken out of their previous context," he said. Erek has placed a group of carpets around his previous work; entitled "Shore Scene Soundtrack" (SSS) they are playfully designed objects which come with a special handbook that give instructions to the viewer about how to make "sounds of waves when they the shore". It is not that complicated: you place your hand on the carpet and move it in a specific way. In 2012 Erek won the prestigious Nam June Paik Award with SSS. In its decision the award jury pointed out that "Erek's SSS/Shore Scene Soundtrack, an ongoing project since 2007, is a performative and conceptual invitation to spectators to 'imitate the sounds of the sea with two hands and a piece of carpet'. This inspiring work transforms the neutral architecture of the exhibition space into a fantastical and poetic place. It challenges the physical and mental characteristics of the artistic experience." He was praised for telling the story of man and the world, with simple means and without relying on complicated media or national idiosyncrasies. "I have been waiting for an opportunity to show these carpets together," Erek said. "This way I can increase the tension that arises when you isolate what is seen from what is heard." Erek was an artist in residence at Amsterdam's Rijksakademie van beeldende kunsten in 2005, and in 2012 created the sound installations in Orhan Pamuk's Museum of Innocence in Istanbul's Çukurcuma neighbourhood. But perhaps he is best known for his rulers. "I've produced the first ruler in Cairo in 2007," he said. "When I had new ideas I produced new ones but I've never thought that their number would almost reach fifteen." Erek described how he produced variations from the original ruler, with ideas like "I did one in Arabic, now I must do one in Latin!" or "now I must produce one about military coups!" Erek said "Pluravocality" is his favourite Istanbul Modern show ever. "To see the connection between the museum and what we classify as 'contemporary art' is exciting and hopeful for someone like me," he said. "I hope that my musician friends who say things like 'oh I don't get contemporary art' or 'I can't enjoy such things' will have the chance to see it." And how does he feel about his work being included in Stedelijk's collection? "To think that I am taken seriously by an institution and people who represent it, for an idea and work that I deeply care for, brings happiness and satisfaction," he said. "To see that they are being exhibited in a city where I have once lived also makes me happy. I hadn't heard from them for some time, they had all the directives about how to set up the work. Last week I was informed that 'Rulers and Rhythm Studies' was put on display." A busy year awaits Erek, with the preparations for the Istanbul Biennial and a new show, "Open Museum, Open City" which will be held between October 24 and November 30 in MAXXI, National Museum of the 21st Century Arts in Rome. But Erek didn't seem much concerned about working with new ideas and artists in such a busy schedule. "I'm in one of my more optimistic seasons," he said.